Convenience products take a big bite out of the prep work in this spectacular restaurant-quality salad. Combine nuts and cinnamon sugar in microwaveable pie plate sprayed with cooking spray; spread evenly onto bottom of pie plate. Microwave on HIGH 1 to 1-1/2 min. or until nuts are toasted, stirring every 30 sec. Toss greens with pears, cheese and cranberries in large bowl. Add nuts and dressing; mix lightly. Serve immediately. Substitute Cracker Barrel Shredded Part Skim Mozzarella Cheese for the shredded Cracker Barrel Cheddar Cheese Light-Made with 2% Milk. 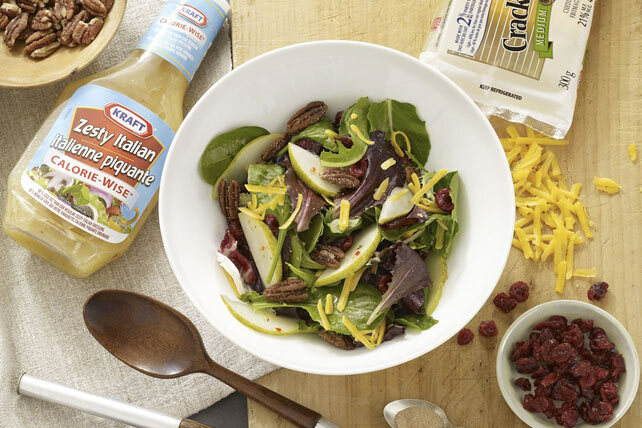 Enjoy this colourful, delicious side salad made with better-for-you ingredients.